Balázs Éry has been working for almost 30 years as a pianist, a composer and a producer with the greatest Hungarian musicians of our time. He has participated in the production of over 100 LPs, which are of a wide range of music, from jazz to pop, from actors’ work to children’s entertainment. He has also composed the soundtrack of Ceasefire!, a cartoon made by Ferenc Rófusz who won the Academy Award in 1980 with his work entitled The Fly. He has participated in large-scale tours, he has several times travelled all around the country. Although he mainly writes piano-based pieces, it has always been very important for him to play in a band, therefore all his albums are made in co-operation with other musicians. The album “Csend” could be mostly described as Soft Adult Contemporary, that is a radio station format, which is almost a cross between AC and Easy Listening. It plays primarily non-current soft rock originals; may also be mixed with Adult Standards or Smooth Jazz. 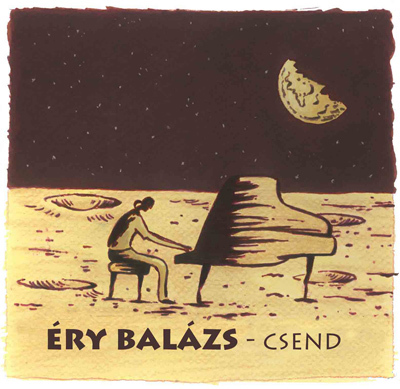 For those who are not familiar with this genre, Balázs Éry’s style can be defined with the terms “romantic instrumentalism” or “semi-alternative music”. With his soul-smoothing music, he tries to protest against the unbearable noise that surrounds us. When you are listening to his songs, it is like listening to a story: every note has something to tell you. If a listener is sensitive enough, s/he can not only hear, but also see the images that are expressed with musical means. Therefore, Balázs Éry’s songs can also be defined as “soundtrack without a film”. It is an intellectual activity to perceive his music completely and precisely, because every tiny detail has its artistic importance.